Background: The aim of the present study was to assess 2- and 4-h postendoscopic retrograde cholangiopancreatography (ERCP) serum amylase and lipase levels for prediction of post-ERCP, pancreatitis (PEP), and their predictive cutoff values. Materials and Methods: In this cross-sectional study, we evaluated serum amylase and lipase levels before the procedure, 2 h and 4 h after the procedure, and in patients with persisting abdominal pain, 24 h afterward. A total of 300 adult patients who underwent ERCP procedures from March 2014 to June 2015 in referral hospital in Isfahan were studied. The receiver operating characteristic analysis was applied to determine the predictive score of amylase and lipase levels for PEP 2 and 4 h after ERCP. Results: The 2-h serum amylase cutoff values of 241 IU/L (normal range: 28–100 IU/L) had a very high negative predictive value (NPV) (98.7%) but a poor positive predictive value (49.2%) for prediction of PEP (area under curve [AUC]: 0.947; 95% confidence interval [CI]: 0.914–0.979). Based on our results, the patients might be considered for supportive therapy of PEP with the 4-h serum amylase above the cut point of 839.5 IU/L with a specificity of 95.1% (AUC: 0.978; 95% CI: 0.964–0.992). In addition, the 2- and 4-h serum lipase levels at cut points of 216 IU/L (AUC: 0.954; 95% CI: 0.931–0.977) and 656.5 IU/L (AUC: 0.966; 95% CI: 0.945–0.986) (normal value <60 IU/L), respectively, had the best sensitivity (97.1%) and high NPVs (99.6%) for exclusion of PEP. Conclusion: Measurements of serum amylase and lipase 2- and 4-h post-ERCP might be useful in prediction of PEP. The present study was conducted to assess the predictive effect of serum amylase and lipase levels 2 h and 4 h after ERCP and also determine their anticipating cutoff score for PEP 2 and 4 h after ERCP. In this cross-sectional study, we evaluate a convenience sample of 300 adult patients, aged 21–90 years, who underwent diagnostic or therapeutic ERCP procedures between March 2014 and June 2015 in a university-affiliated teaching hospital in Isfahan, Iran. Patients were not eligible for inclusion if they had a history of pancreatitis, surgically altered enteric anatomy or hyperamylasemia. Standard techniques and side-viewing duodenoscope (TJF-145; Olympus Corp., Tokyo, Japan) were used for executing ERCP procedures using 2 endoscopists (MM, VS). After the procedure, all the patients were admitted to the hospital for a minimum period of 24 h to observe the early signs and symptoms of any complications. Serum amylase (using a calorimetry method, Pars Azmoon Co., Tehran, Iran, normal range: 28–100 IU/L) and lipase (using a calorimetry method, BioRex Fars Co., Shiraz, Iran, normal value <60 IU/L) concentrations were measured in all patients before, and 2 and 4 h after the procedure. Patients' demographic data were also obtained. Symptoms (abdominal pain, nausea, and vomiting) and signs (abdominal tenderness) of pancreatitis were clinically evaluated for 24 h after the procedure. Patients with a persistent abdominal pain consistent with PEP underwent measurements of serum amylase and lipase 24 h after the ERCP. PEP was characterized by newly started or exacerbated abdominal pain and a serum amylase level of at least 3 times higher than the normal value within a 24-h period postprocedure. All tests were carried out with SPSS version 20 (SPSS Inc., Chicago, IL, USA) software. Chi-square test and independent t-test were used for comparing categorical and nominal data. An independent t-test was subsequently used to compare serum amylase and lipase levels between 2 groups (Group A – patients without evidence of PEP and Group B – patients with evidence of PEP). The receiver operating characteristic (ROC) analysis was applied to find the predictive score of amylase and lipase levels for PEP, 2 and 4 h after ERCP. Statistical significance was set as P < 0.05. This study was approved by the Human Research Committee at Medical University of Isfahan and written informed consent was obtained from all patients (Research Project number: 393488). We studied 300 patients (mean age 60.5 ± 16.3 years, 50.3% [n = 151] male [mean age 63.2 ± 14.2], 49.7% [n = 149] female [mean age 57.8 ± 17.7]) who underwent diagnostic and therapeutic ERCP procedures. PEP occurred in 35 (11.7%) patients. Conservative treatment led to the improvement of all the patients who developed PEP; no deaths were recorded. The mean age of the patients was 51.3 ± 14.4 years in the group with PEP and 61.5 ± 16.3 in the group without PEP. An independent t-test demonstrated that patients of a younger age had a higher risk factor of PEP (P< 0.001). The male to female ratio of patients with PEP was 17:18. The analyses indicated that there was no correlation between PEP and patient's gender (P = 0.82). According to the analyses, the mean serum concentrations of amylase in the group with PEP were 729.11 ± 77.72 IU/L (ranged from 93 to 1805 IU/L) 2 h after ERCP, and 1531.77 ± 105.42 IU/L (ranged from 600 to 3065 IU/L) 4 h after ERCP. The patients with PEP had higher amylase levels 2- and 4-h post-ERCP than patients without evidence of PEP (P< 0.001) [Table 1]. 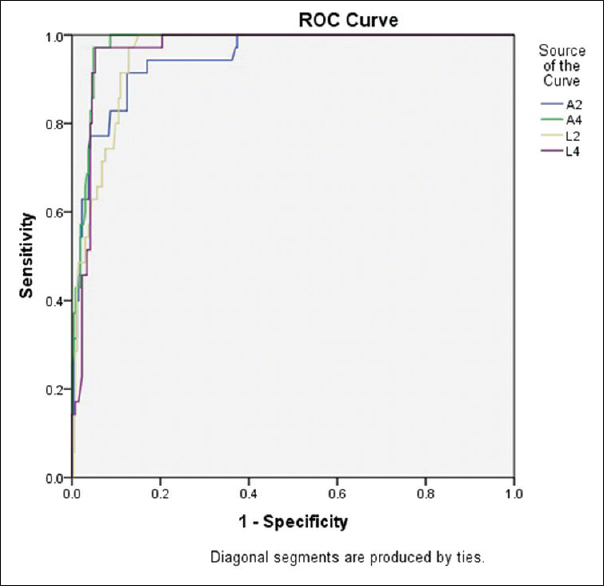 Using ROC curve for 2-h post-ERCP serum amylase showed that the area under the curve (AUC) was 0.947, which indicated that the determined test was an appropriate predictor of PEP [Figure 1]. The 2-h serum amylase cutoff values for predicting PEP was 241 IU/L, with a sensitivity of 90%, and a specificity of 87.5% that exhibited a very high negative predictive value (NPV) of 98.7% [Table 2]. As a result, the cutoff scores of 2.5 times the upper limit of normal (ULN) at our study center were found useful for ruling PEP out. In addition, we found out that PEP can be predicted by the 4-h serum amylase at a cut point of 839.5 IU/L (8 times the ULN) with a sensitivity of 97.1% and specificity of 95.1% (AUC = 0.978) [Figure 1] and [Table 2]. This cut point was found to be beneficial for directing preventive therapy of PEP with a good positive predictive value (PPV) of 72.3%. Furthermore, the 4-h serum amylase levels at a cut point of 1.5 times the ULN had very high NPVs (100%), which means useful for safe discharge of outpatients who underwent ERCP procedures. Based on the analyses, the 2-h serum lipase levels at cut point of 216 IU/L had the best sensitivity (97.1%) and NPVs (99.6%) for the exclusion of PEP (AUC = 0.954). The 4-h serum lipase at cutoff levels of 10 times, the ULN demonstrated the same sensitivity (97.1%) but more specificity (94.7%) [Figure 1] and [Table 2]. Acute pancreatitis is the most common and serious complication of ERCP, which would result in considerable morbidity, and sometimes even mortality. The mechanisms that would generate PEP are complex and have not been fully recognized yet. Its incidence varies from 5% to 10%,, and up to 25% in those with suspected Sphincter of Oddi More Details dysfunction (SOD) or in those with a history of PEP. The incidence of PEP was 11.6% in our study patients as a whole. Based on the previous studies, suspected or known SOD, young age, female gender, and previous history of pancreatitis have been found to be independent risk factors for PEP.,, In a large case–control study of 12718 ERCP procedures, the independent risk factors were young age, female gender, prolonged procedure time, and elective ERCP. We found that younger age increased the risk for PEP, which is consistent with multiple previous studies.,,,,, Contrary to previous studies,,,,, the incidence rate of PEP in female individuals was not higher than that of male individuals in our study. As we know, PEP might be recognized early after the procedure by assessing the serum amylase or lipase levels.,, Observational studies have found that serum amylase or lipase values <1.5 and 4 times the ULN, respectively, obtained 2–4 h post-ERCP have a very high NPV for PEP. Therefore, guidelines have suggested to test serum amylase or lipase 2–6 h after ERCP procedures in patients suffering from abdominal pain and who are to be discharged on the day of ERCP; the patients can be discharged safely if serum amylase or lipase values are less than these cutoffs., A study involving 231 patients who underwent ERCP had determined that 2-h serum amylase and lipase levels were more accurate in distinguishing nonpancreatitis abdominal pain from PEP. This was in contrast to clinical assessment, which was unreliable. Serum amylase values below 276 IU/L and lipase values below 1000 IU/L were useful in ruling out PEP with NPV of 0.97 and 0.98, respectively. Ito et al. found that PEP was associated with an increase in serum amylase level greater than twice the ULN at 3 h after ERCP procedures with an elevation at 6 h. Therefore, when serum amylase level is more than 2 times, the normal limit at 3 h after the procedure, measurements of serum amylase should be repeated at 6 h after ERCP; a decrease in serum amylase levels at 6 h suggests a low probability of PEP. In our study, measurements of serum amylase and lipase 2–4 h post-ERCP were useful in prediction of PEP, and these findings were consistent with multiple previous studies. The 2-h serum amylase cutoff values of 2.5 times the ULN (241 IU/L) had a very high NPV (98.7%) but a poor PPV (49.2%) for prediction of PEP. Based on our results, patients who underwent ERCP procedures could be discharged without concern about risk of PEP if the 4-h serum amylase levels were below 1.5 times the ULN. Furthermore, the patients might be considered for supportive therapy of PEP with the 4-h serum amylase above the cut point of 839.5 IU/L (8 times the ULN) with specificity of 95.1% and a good PPV of 72.3%. In addition, the 2- and 4-h serum lipase levels at cut point of 216 IU/L and 656.5 IU/L had the best sensitivity and high NPVs for exclusion of PEP. However, this study encountered some limitations. First, ERCP related confounders associated with PEP, such as number of cannulation attempts, cannulation time, and pancreatic duct cannulation were not analyzed. Second, the severity of pancreatitis was not classified. These factors might have influenced the cutoffs of best sensitivity and specificity for prediction of PEP and limited generalizability. The data analyses of this study imply that measurements of serum amylase and lipase 2–4 h post-ERCP were useful in prediction of PEP. We gratefully acknowledge Mr. Hasan Zadeh for his contribution to statistical analysis. We also want to thank the patients who participated in the current study. This study was supported by Isfahan University of Medical Sciences. Dumonceau JM, Andriulli A, Elmunzer BJ, Mariani A, Meister T, Deviere J, et al. Prophylaxis of post-ERCP pancreatitis: European society of gastrointestinal endoscopy (ESGE) guideline – Updated June 2014. Endoscopy 2014;46:799-815. Tenner S, Steinberg WM. Acute pancreatitis. In: Feldman M, Friedman LS, Brandt LJ, editors. Sleisenger and Fordtran's Gastrointestinal and Liver Disease. 10th ed. Philadelphia: Elsevier Saunders; 2016. p. 969-93. Freeman ML, DiSario JA, Nelson DB, Fennerty MB, Lee JG, Bjorkman DJ, et al. Risk factors for post-ERCP pancreatitis: A prospective, multicenter study. Gastrointest Endosc 2001;54:425-34. Shaygan-Nejad A, Masjedizadeh AR, Ghavidel A, Ghojazadeh M, Khoshbaten M. Aggressive hydration with lactated ringer's solution as the prophylactic intervention for postendoscopic retrograde cholangiopancreatography pancreatitis: A randomized controlled double-blind clinical trial. J Res Med Sci 2015;20:838-43. Lee YK, Yang MJ, Kim SS, Noh CK, Cho HJ, Lim SG, et al. Prediction of post-endoscopic retrograde cholangiopancreatography pancreatitis using 4-hour post-endoscopic retrograde cholangiopancreatography serum amylase and lipase levels. J Korean Med Sci 2017;32:1814-9. Nishino T, Toki F. Prediction of post-ERCP pancreatitis. In: Rodrigo L, editor. Pancreatitis – Treatment and Complications. InTech; 2012. Freeman ML, Guda NM. Prevention of post-ERCP pancreatitis: A comprehensive review. Gastrointest Endosc 2004;59:845-64. Aliperti G. Complications related to diagnostic and therapeutic endoscopic retrograde cholangiopancreatography. Gastrointest Endosc Clin N Am 1996;6:379-407. Tulassay Z, Papp J, Koranyi L, Szathmari M, Tamas G, Egyetem S, et al. Hormonal and biochemical changes following endoscopic retrograde cholangio-pancreatography. Acta Gastroenterol Belg 1981;44:538-44. Ito K, Fujita N, Noda Y, Kobayashi G, Horaguchi J, Takasawa O, et al. Relationship between post-ERCP pancreatitis and the change of serum amylase level after the procedure. World J Gastroenterol 2007;13:3855-60. Cotton PB, Lehman G, Vennes J, Geenen JE, Russell RC, Meyers WC, et al. Endoscopic sphincterotomy complications and their management: An attempt at consensus. Gastrointest Endosc 1991;37:383-93. Freeman ML, Nelson DB, Sherman S, Haber GB, Herman ME, Dorsher PJ, et al. Complications of endoscopic biliary sphincterotomy. N Engl J Med 1996;335:909-18. Masci E, Toti G, Mariani A, Curioni S, Lomazzi A, Dinelli M, et al. Complications of diagnostic and therapeutic ERCP: A prospective multicenter study. Am J Gastroenterol 2001;96:417-23. Bailey AA, Bourke MJ, Kaffes AJ, Byth K, Lee EY, Williams SJ, et al. Needle-knife sphincterotomy: Factors predicting its use and the relationship with post-ERCP pancreatitis (with video). Gastrointest Endosc 2010;71:266-71. Swahn F, Nilsson M, Arnelo U, Löhr M, Persson G, Enochsson L, et al. Rendezvous cannulation technique reduces post-ERCP pancreatitis: A prospective nationwide study of 12,718 ERCP procedures. Am J Gastroenterol 2013;108:552-9. Omar MA, Ahmed AE, Said OA, El-Amin H. Risk factors for post- ERCP pancreatitis: A prospective multicenter study in upper Egypt. Egypt J Surg 2015;34:1-10. Korkmaz H, Temel T. Incidence, risk factors, recognition and prevention of post-ERCP pancreatitis. IJMMS 2013;1:4-9. Thaker AM, Mosko JD, Berzin TM. Post-endoscopic retrograde cholangiopancreatography pancreatitis. Gastroenterol Rep (Oxf) 2015;3:32-40. Gottlieb K, Sherman S, Pezzi J, Esber E, Lehman GA. Early recognition of post-ERCP pancreatitis by clinical assessment and serum pancreatic enzymes. Am J Gastroenterol 1996;91:1553-7.